21 of us started the steep ascent for the next 4 hours (from 8 AM to 12 Noon), very soon we came to know that Rakesh � the Gujarati youngster - had taken the decision to stay back at Juda Talao. It was by far the most difficult stretch that we faced, usually marked by narrow path on the slopes of the hills and thin layer of melting ice made it much more difficult to walk. We were also happy to encounter first patches of ice / snow on this trek. We encountered many streams flowing over the rocks, quite frequently during the day and our lunch point for the day was just after crossing one such stream � there was no tea point today but there was one before. One thing we noticed prominently was absence of houseflies, which gave us company at lunch point on the previous day. By 2.30 PM we completed the day's trek of about 7.5 km, reaching an altitude of 10500 ft and we were at the foot of the mountain that we set out to conquer � the Kedarkantha. 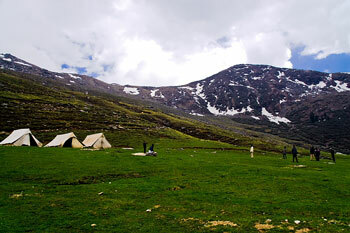 The campsite locale was the most beautiful stretch of meadows, that we would see in the entire trek, surrounded on two sides by hills and valley on other sides. The campsite gets weak signals of Airtel. It was an afternoon when people were either busy trying to contact their kith and kin after about 3 days or busy looking for ideas to capture the surrounding beauty through their skills in photography. 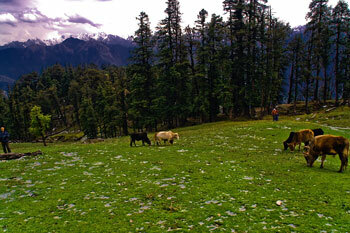 Soon after it started raining, this time it was very heavy � heaviest that we would see any where in our trek. Worse that the water flowing down the hills was gushing straight through our tent below the tarpaulin. The drain facility provided outside the tent for diverting the rain water flowing down the hill was not sufficient as it was chocked by the hails and as a result water found its way into the tent and out. Since YHAI made facility for around 50 participants and we were only 21, we could safely occupy another empty tent. But before that we enjoyed trying to dig trenches / deepen the drains to divert water flow behind our old tent and did the same as a precautionary measure around the new tent that we had occupied later.